You are here: Home / Is It Paleo? / What is MCT Oil? Whether you’ve been in the Paleo world for a while or you’re a newcomer, you’ve probably heard some talk about MCTs or MCT oil thanks to the popularity of things like Bulletproof coffee and coconut oil. What is MCT oil? What are the benefits? How do you incorporate it into your diet? MCT stands for medium-chain triglycerides (also referred to as medium chain fatty acids). To fully understand MCT oil and its benefits, we first need to discuss the different types of fatty acids. Fats can be classified as one of three types depending on the chemical structure: short-chain (meaning the fat has a structure with 5 or less carbon atoms); medium-chain (between 6 and 12 carbons); and long-chain (over 12 carbons). In regards to medium-chain triglycerides, there are four types: caproic acid (abbreviated C6 which means 6 carbons); caprylic acid (C8); capric acid (C10); and lauric acid (C12). The fewer amount of carbons in an MCT, the more quickly they are absorbed in the body. The structure of a fat determines the way it is processed by the body. Most dietary fats that make up a standard American diet are considered to be long-chain triglycerides. Because of the structure of a long-chain triglyceride, our body has to do some work to this type of fatty acid before it can be digested and used as energy. This is where the structure of medium-chain triglycerides come into play. Our body can absorb MCTs very easily because of the reduced chain length – unlike long-chain triglycerides that require more processing beforehand. Without diving too deep into the science of this process, MCTs can passively diffuse from the GI tract to the bloodstream where they can be converted to energy by the liver. Basically, our body can break down these fatty acids and use them as energy really quickly. The most common whole food source of MCTs is coconut oil. About 65% of coconut oil’s fatty acids are considered medium-chain. Palm kernel oil and full-fat dairy are two other food sources of medium-chain triglycerides. If you want to learn more about healthy fats, check out the Ultimate Paleo Guide to Cooking with Healthy Fats. As you can probably guess by now, MCT oil is concentrated medium-chain triglycerides. Depending on the brand used, MCT oil is extracted from either coconut or palm kernel oils. Generally, MCT oil is composed of the medium-chain triglycerides C8, C10, or a combination of the two. This is an important distinction because these two types of fatty acids are able to be rapidly absorbed by the body, which provides a very quick natural energy boost. The main upside of MCT oil is the fact that it can be easily used by the body as energy – thanks to its chemical structure. The ease with which MCTs can be digested by the body makes the oil a great choice for people who have digestion or malabsorption issues (1). Also, because MCTs can be rapidly absorbed and burned as energy, there is less of a chance that the triglycerides get stored as fat in the body (2). MCTs also promote the creation of ketones. Ketones, like glucose, can be utilized by the brain as energy, and many people report that using the oil helps improve their cognitive function and increases mental clarity. Studies have also shown that ingesting medium chain triglycerides help increase thermogenesis and boost metabolism in the body (3). MCT oil is tasteless and odorless, so the applications are endless. You can take it straight or include it in food. Many people use it in their coffee in the morning – as made famous by Dave Asprey and Bulletproof coffee. You can also add it to shakes, smoothies, and even salad dressings. MCTs have also been shown to be beneficial for the skin, so feel free to add it to your homemade lotions and lipbalms. MCT oil is a refined product. In any refining process, it can be hard to know exactly what occurs. Because of this, I would suggest buying a high quality oil that explains how the product is created. Also, lauric acid, a medium-chain triglyceride with 12 carbons, is left out of MCT oil in most cases. This is because it is not as quickly absorbed in the body when compared to C8 and C10. 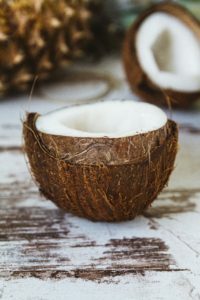 Lauric acid, though, is what gives coconut oil its strong antimicrobial/viral/bacterial properties that made coconut oil so popular in the first place. If your only source of MCTs is from an MCT oil that does not include lauric acid, you could be missing out on these benefits. Because of its ability to be absorbed and used rapidly in the body, the addition of MCT oil in you diet too quickly can cause increased and frequent (and sometimes unexpected) bowel movements. Start slow (think ½ teaspoon/day) and build from there as your body allows. 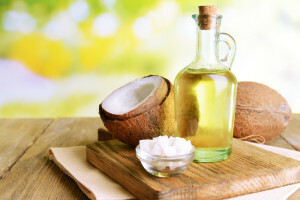 Whether you decide to use MCT oil or would rather stick to coconut oil as your go-to source of medium-chain triglycerides, there’s no denying the fact that these fatty acids have their perks. Have you tried MCT oil before? What’s your experience? I’d love to hear your thoughts.